There’re big fishes and sharks around the beach. Be careful that fishes will bite you if you’re trying to feed them because I was even bitten on my cheek. I have not been to Pulau Payar for the last 17 years and had expected the visibility to have plummeted but found that it is still good despite the many snorkelers and divers to the area. Went via Langkawi Coral and onto the pontoon at Pulau Payar. Service was good; ferry/boat was packed with holiday makers. Great selection of food at the buffet lunch. Langkawi Coral also provided glass bottom boat and short boat transfers to the main jetty for you to swim from the shore and share the sea with black tip sharks (they were around 3 feet long), who swim close to shore. We snorkeled off from the pontoon and saw soft corals, trigger fish, lots of parrot fish, 2 huge groupers, one scorpion fish under the rock (you would need to look really hard), tangs, clown fish and we even saw the black tip sharks close to shore. You can easily snorkel to the beach and spend some time there if you wish to or get some sun on the sun deck on the pontoon. Be sure to snorkel within the cordoned off area, for safety. Langkawi Coral picks you up from the hotel about 8am. Boat leaves about 9.45am and reaches Pulau Payar about 10.30am. Lunch is 12.30 – 1.30pm. The boat takes you to the jetty from 1.15pm; every 10 minutes. Thereafter, depending on visibility, the glass bottom boat takes you around from the pontoon. Boat back to Kuah departs 3pm. Life jackets are available. Those who wish to sign up for a discover scuba can also do so and divers can also dive with Langkawi Coral. There are snacks for sale on the pontoon and they give you a big basket to put your belongings at each table (can seat 6) and they have cctv so it is pretty safe. The Payar marine park is both a stunning and beautiful place suitable for tourists who are novices in snorkeling and diving. This was very good value. They provided a good lunch and the snorkeling was great. Black fin sharks were plentiful and the coral was amazing. A Barracuda was a cool surprise and had to be 2 meters long! Back to the snorkeling, head to the beach as soon as possible. School of fishes and sharks around you, really good experience and the sharks swim fast and they are big! They are totally harmless, let them swim in peace! I ENJOYED THE SNORKELING PART VERY MUCH! The package includes transportation from hotel, not much explanation until you got to the platform and it was not clear, just go along… just be the tourist and move along Wahahah! I do have to say that our belongings left on the table in the Coral Platform was OK safe, of course do bring too much valuables to these activities! Hint: When you get onto the ferry to get to the Coral platform, set at the back, so you can move quickly to the open top and away from the freezing cold cabin! I guess it’s local law that you have to seat inside when the ferry is at the pier and you are free to go up in the middle of the sea. 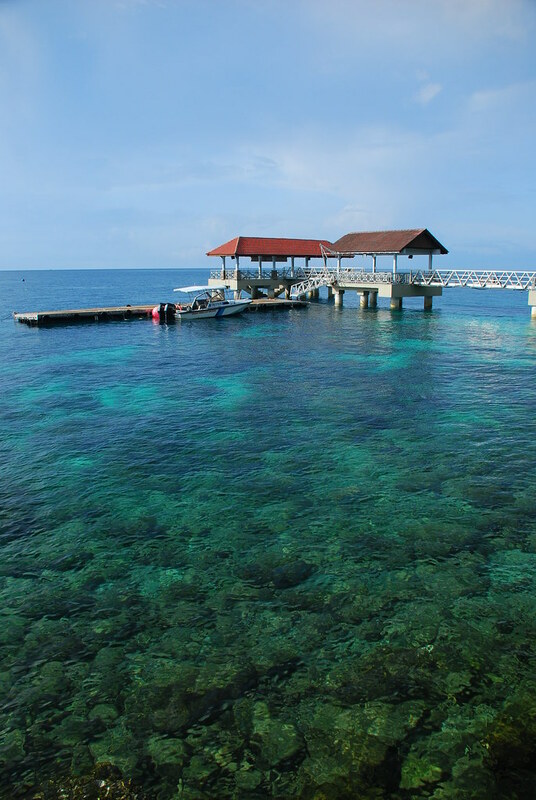 This is the platform where you will be starting your diving or snorkeling trip. This is the one of the best island for snorkeling with lots of sharks around. they wont bite you. many different and colorful fishes around but wear a tshirt because small fishes are biting. It wont hurt that much just like injection just for a second. but its not dangerous and will hurt you. but the experience is wonderful. Toilet is very dirty and food is not that good. They should work on that to make this place better. Tourists are seen feeding the fish with bread. It's fun but it may be ecologically damaging to these marine lives. 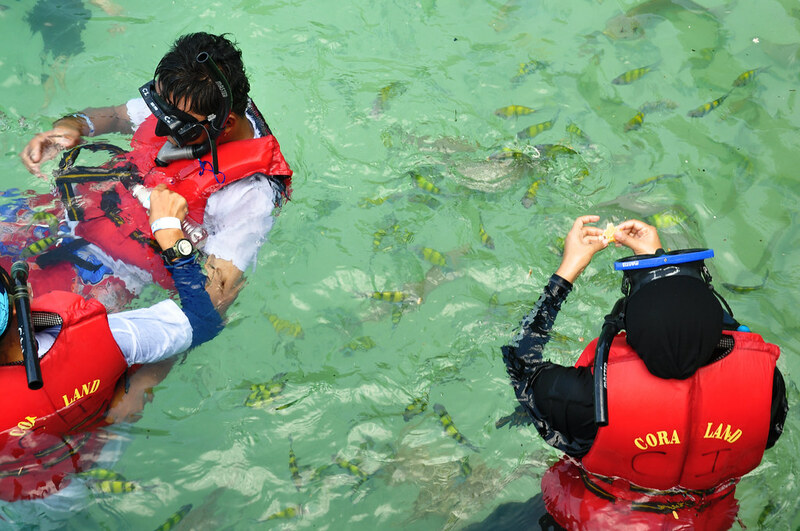 Pulau Payar Marine Park is located about 19 nautical miles south of Langkawi, 32 nautical miles north of Penang and 15 nautical miles west of Kuala Kedah. The island was gazetted as a marine park in 1994. If you are coming from Kuah, Langkawi, it takes only about an hour of boat ride. 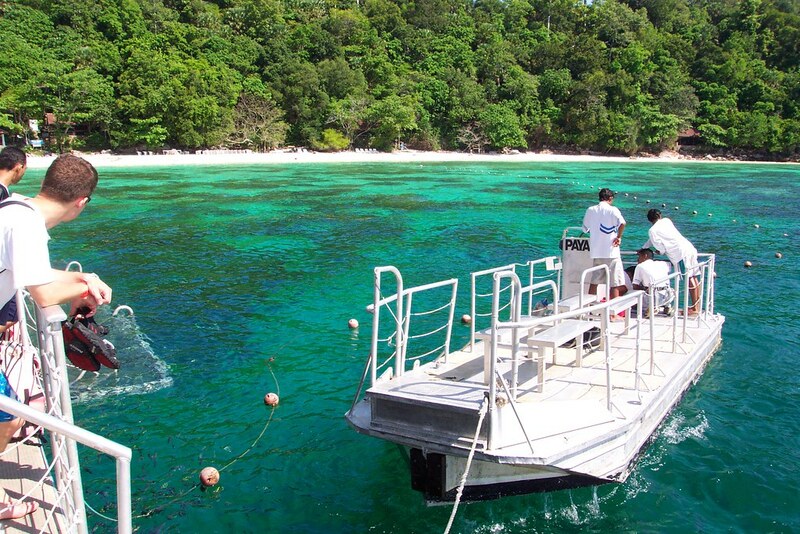 The Pulau Payar Marine Park is literally a heaven for divers and snorkelers. There are some smaller islands scattering around Pulau Payar. A few islands that are ideal for diving and snorkeling are Lembu, Segantang and Kaca. Diving and snorkeling around Pulau Payar and these islands is an eye-opening experience for someone who is seeing the underwater world for the first time. In addition, diving and snorkeling in Pulau Payar is ideal for first timer since it’s cheaper and the shore current is not too strong. You can literally see the coral reefs from the dock because the water is so clear. Even though Pulau Payar is being developed as a tourist destination, the development here is limited and is extremely restricted. Therefore, there are no resorts being built on Pulau Payar. But you can find some basic facilities such as a restroom and a changing room near the coast. Moreover, there are gazebos, picnic table and restroom facilities at selected areas for visitors. 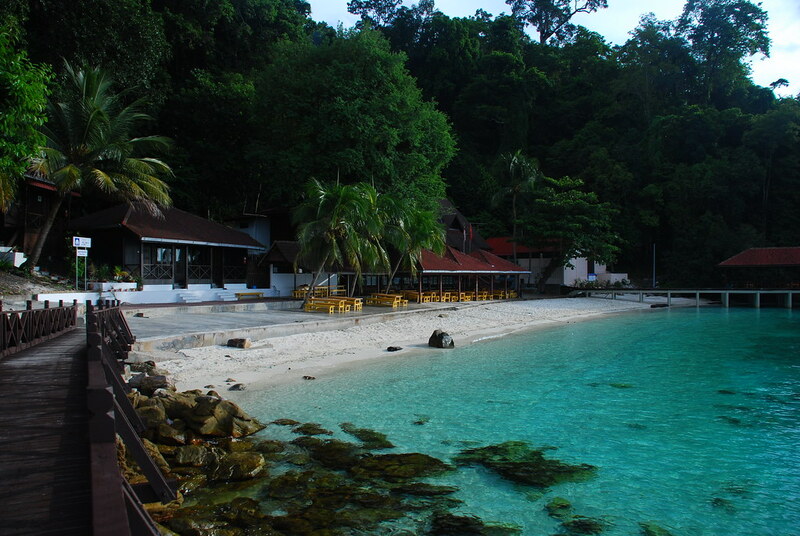 Other than diving and snorkeling, hiking is also an ideal activity in Pulau Payar. Two hiking trails are available for visitors to explore the fascinating terrestrial flora and fauna on the island. One of the most interesting things to do is marine mammal and fish watching as Pulau Payar Marine Park is part of the migration route for these marine life. Pulau Payar and its surrounding islands’ cluster of coral reefs are teeming with marine life such as moray eels, large groupers and black-tipped reef sharks. The Coral Garden in the sheltered, clear waters off Pulau Payar is enduringly popular and is said to have the largest number of coral species in Malaysia. Here visitors can also feed baby sharks under the supervision of experts. To visit, it’s best to book a day in advance with a tour group. Plenty of baby sharks can be seen swimming around near the coast of Pulau Payar. Hundreds or more people are unloaded onto this small and fragile piece of paradise daily and it is really taking it’s toll on the wildlife. The beach is especially dirty due to the leftover by tourists such as plastic bag and styrofoam used for packing food. It’s especially sad for the corals where a lot of them have either die or decayed due to pollution and the large number of tourists visiting the island everyday. Moreover most of the tourists are not given proper education on how to protect the fragile marine lives. I have seen a lot of them stepping on the corals while snorkeling. Besides, tourists should not feed the fishes especially the sharks because once they are given human food, they will forever rely on it and lose their natural hunting skills. The Payar marine park can be easily damaged due to over-crowding of tourists and pollution caused by rampant dumping of garbage all over the coast. If the tourists stop coming or the human stop feeding them, these fishes will die of starvation because of losing their natural ability to look for food in the wild. Within few years, the marine lives here will probably be destroyed due to lack of foresight and mismanagement. My suggestion is to educate the tour operators about the environment issues so that the tourists can be given proper guidance on how to protect these fragile marine lives. Besides, the large amount of garbage that is produced by tourists should properly be disposed of and should not be left on this island. One suggestion is to have the ferries that fetch tourists here to carry the garbage back to the mainland to be properly disposed of. If the sustainability issue of this island can be addressed, Pulau Payar will certainly make a great diving and snorkeling destination. Tree Top Walk – Immerse in the serene surroundings at Sedim River as you gaze from the lofty Tree Top Walk, Kulim’s newest attraction. This impressive steel structure spans 950 meters among lush treetops and is currently the world’s longest canopy walkway. Underwater World Langkawi – Visit the largest aquaria in the country and view 4,000 varieties of animals from three different ecosystems. Among the attractions here are the Harbour Seals, African and Rock Hopper Penguins, Mata-mata Turtles as well as the Anaconda, Marmoset, Arapaima and Capybara.